Get a GTX 1080 or 1070 for under $450, an RX 580 for less than $250, or an RX 560 for $100 at Newegg right now. Heads up, Madden-on-the-PC fanatics: Today’s a great day to get a powerful graphics card capable of pushing pigskin pixels far beyond what consoles can muster, or you can hit the gridiron with a bargain GPU with respectable frame rates at a good price. Newegg's offering deep discounts on a ton of GPUs today, including the GeForce GTX 1080, or a GTX 1070 with a liquid cooler for under $500. On the AMD side, a Radeon RX 580 is under $250, and an RX 560 hits the $100 price point. Act fast though: Most of these deals expire on Sunday, August 5. The EVGA GeForce GTX 1080 SC Gaming ACX 2.0 is $450Remove non-product link at Newegg right now when you use the checkout code EVGA18US. That’s $20 cheaper than the MSRP, plus you get a copy of Destiny 2 and its first two expansions for free when you register your purchase with EVGA (PDF). The card should excel at 1440p and 1080p gaming, and put forth a respectable showing at 4K resolution if you dial back some graphics settings. EVGA's ACX coolers keep hardware running chilly and quiet, too. If you want something a little fancy (but less powerful than the 1080), the liquid-cooled EVGA GeForce GTX 1070 FTW is $450Remove non-product link with the checkout code EMCPXPS27. That’s $130 off Newegg’s price, and $60 off Amazon’s current price. This deal doesn’t include a free game, but that liquid cooler is a killer feature if you've got room for it in your rig. 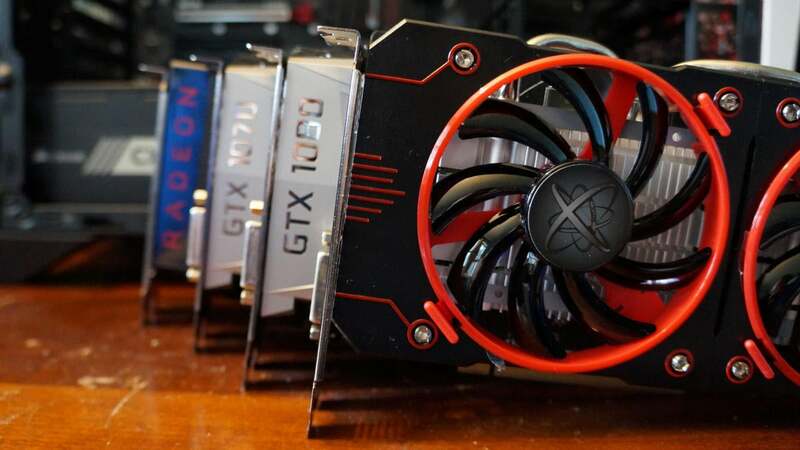 Stock GTX 1070 cards cost around $400 and integrated liquid-cooling usually adds $100 or $150 to the price of a GPU thanks to the incredibly low temperatures they enable—which, in turn, can help you push overclocks higher. The GTX 1070 chews through games at 1440p and 1080p resolution. Moving on to Team Red, an 8GB Asus Radeon RX 580 is $240Remove non-product link with the checkout code EMCPXPS22. That’s $35 cheaper than what you’ll find elsewhere. The Radeon RX 580 delivers flawless 1080p gaming at 60fps even when you crank all available graphics bells and whistles, and a pretty solid showing even at 1440p resolution if you're happy using High settings rather than Ultra. This particular model is especially well-suited for 1440p gaming thanks to its sizable 8GB memory capacity. Finally, the PowerColor Red Dragon Radeon RX 560Remove non-product link is $100 after a $20 mail-in rebate, so you'll need to spend $120 upfront. Unlike the other cards in this round-up, this RX 560 deal just drops a bargain basement card back to its MSRP, but that’s still notable in the current inflated GPU market. This is one of those underpowered Radeon RX 560s with fewer stream processors (896 instead of 1,024) and compute units (14 instead of 16). This card has enough guts to hit the minimum requirements for Madden 19, but do yourself a favor and limit your frame rates to console level 30fps for a more enjoyable experience.